Second only to the great solid stream versus fog debate, ventilation strategies seem to create the most discussion and disagreement among fire service practitioners. Vertical or horizontal; natural, negative, or positive pressure; vent before, during or after fire control? These are all good questions (many of which have more than one answer). BC Kriss Garcia recently published an interesting article titled Education vs. Training in Fire Space Control ( Fire Engineering, September 2008) examining the difference between training and education, in particular as it relates to ventilation strategies. Kriss emphasized that we train to improve performance and efficiency, but use education to develop our ability to think and understand not only how, but when, why, and why not. Both are critical to today’s firefighters and fire officers. Absolute control of the space you are opening is necessary for a safe and effective fire attack. If firefighters cannot control the space with enough direct application of [British thermal unit] Btu -quenching water, they should not be opening the space, encouraging additional free burning. The concepts included in this brief statement are critical, but could be expanded and clarified a bit. Developing and maintaining control of the space is critical to offensive firefighting operations and the survival of civilian fire victims who may be trapped in the building. Increasing the air supply to a ventilation controlled fire will increase the heat release rate. Heat release rate is measured in kilowatts (kW) or British thermal units (Btu)/m. Water application in liters or gallons per minute (lpm or gpm) must exceed the critical rate of flow based on the heat release rate (kW or Btu/min) developed by the fire. There are two key differences in this expanded outline of the importance of understanding the influence of changing the ventilation profile: 1) Recognizing and understanding the dominant influence on current fire development, fuel or ventilation. Heat release rate from a fire burning in the ventilation controlled burning regime will increase if the fire receives additional air. 2) Water application (lpm or gpm) must be sufficient to overcome the heat release rate from the fire. While it is common to hear firefighters say that gpm must overcome Btu, this is not completely correct. Btu is a measure of energy much the same as liters or gallons is a measure of the volume of water. Kilowatts (1000 joules/second) or Btu/minute are a measure of heat release rate as lpm or gpm are a measure of water application rate. Tactical ventilation is the other element of space control. Smoke contains unburned pyrolizate and flammable products of incomplete combustion, and as such is fuel. Hot fuel gases overhead can be cooled, providing a buffer zone around the nozzle team, but only when smoke is removed through tactical ventilation is this hazard fully mitigated. The difficulty that some firefighters have in accepting positive pressure ventilation or positive pressure attack is frequently rooted in a lack of understanding. In some cases, this based on dogmatic attachment to other tactical approaches. In other cases, it is a result of too much training (how to do it) and not enough education (why, why not, and when). Kriss emphasizes the value of positive pressure ventilation and the need to balance training and education to develop both skills proficiency and understanding. The concluding paragraph of Kriss’s article Education vs. Training in Fire Space Control ( Fire Engineering, September 2008) makes two strong statements. Regardless of the approach we use to safely control fires, we must maintain as the basis of all discussions our ability to control the fire space prior to opening it. The most dramatic means of accomplishing this is through control of the interior environment with [positive pressure attack] PPA and direct water application. I am fully in agreement with the first sentence. Maintaining control of the fire space is absolutely critical to safe and effective offensive operations. However, the second sentence, which so emphatically supports PPA integrated with direct attack without qualifying the conditions under which this tactic should or should not be used, could be a bit misleading. Under many conditions, PPA and direct attack will be extremely effective. In other circumstances, these tactics are not appropriate. For example, Positive Pressure Attack for Ventilation and Firefighting by Garcia, Kauffmann, and Schelble, identifies several contraindications to use of PPA, inclusive of victims in the exhaust opening or other area which may be threatened and extremely ventilation controlled fire conditions which may present risk of backdraft. In firefighting there are no silver bullets. Increased understanding of the theoretical foundations of fire behavior and the influence of ventilation and applied research such as that done by the National Institute for Standards and Technology are the key to effective use of ventilation strategies and improving the safety and effectiveness of fireground operations. Firefighters should not uncritically accept current practice. Neither should firefighters accept new or different approaches without the same thoughtful and critical examination. Not just what and how, but why! Kriss’s Positive Pressure Attack website has a wide range of resources related to positive pressure ventilation and positive pressure attack. As Kris advises, both education and training are critical to safe and effective firefighting. Positive pressure attack is an extremely powerful tool when used correctly, be a student of your craft and learn not just what and how, but why! Kris also published an article titled The Power of Negative Thinking in October issue of FireRescue magazine. This article takes a look at how pressure differences inside and outside the fire building influence ventilation. This interesting article will be the focus of a future post. Quantitative analysis of firefighter injuries and fatalities uses statistics to describe what has occurred and identify patterns and trends. Annual reports and longitudinal (multi-year) quantitative studies provide one way to examine firefighter safety performance. Examination of firefighter fatalities and injuries over time requires consistency of method when comparing data from year to year. However, dividing fatalities and injuries into a small number of causes or injury or death provides a coarse grained picture of the problem. This is useful, but not sufficient. Reporting system limitations in dealing with multiple causal and contributing factors also limits firefighter injury and fatality statistical analysis and reporting. Quantitative analysis is extremely useful in identifying trends and pointing to issues needing further examination. 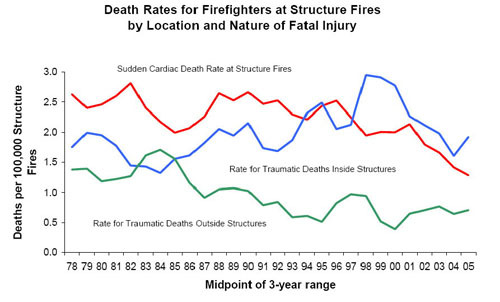 Identification of the increasing rate of firefighter fatalities inside buildings during structural firefighting is one example. However data and system limitations may preclude a fine grained quantitative analysis of this issue. Qualitative analysis of firefighter injuries and fatalities often involves examination of individual incidents, describing in detail what happened in that specific case and identifying causal and contributing factors. The limited information provided by annual reports and longitudinal analysis of firefighter injuries and fatalities can be enhanced by examining individual cases. The NIOSH Firefighter Fatality Investigation and Prevention Program investigates many firefighter fatalities as a result of trauma (see the NIOSH Decision Matrix). However, they do not generally investigate non-fatal incidents and do not investigate near miss events. In addition to not examining all traumatic fatalities there is often a considerable delay in beginning the investigative process. This delay may result in the building involved being demolished and loss of important detail in witness interviews. My last two posts looked at the US Forest Service approach to Investigating Wildland Fire Entrapments and Peer Review Process to identify lessons learned. Application of these methods in structural firefighting would provide an excellent method for improving our understanding of applied fire dynamics, tactical operations, and decision-making as well as other hazards such as structural collapse, and firefighter disorientation. Fire service organizations should examine all events that involve structural fire entrapment, collapse entrapment, and disorientation. There are no commonly accepted definitions for these types of events. However, the US Forest Service definition for wildland fire entrapment could serve as a starting point for defining entrapment and disorientation in the structural environment. Structural Fire Entrapment: a fire behavior related event involving compromise of normal (planned) means of egress; or thermal exposure resulted in, or had significant potential for death, injury, or damage to personal protective equipment. Collapse Entrapment: A structural failure related event involving compromise of normal (planned) means of egress, or impact resulting from structural failure (load bearing or non-load bearing) that resulted in, or had significant potential for death, injury, or damage to personal protective equipment. Disorientation Entrapment: Loss of spatial orientation while operating in a hazardous atmosphere that resulted in, or had significant potential for death or injury. Note that like the US Forest Service definition of wildland fire entrapment; these events are inclusive of fatalities, injuries, and near miss events. Investigating a near miss or accident involving a serious injury or fatality may present significant challenges to an individual agency in terms of resources and expertise. Individuals and organizations also filter information through cultural norms which define “the way we do things”. Use of a multi-agency team reduces these potential challenges. However, as in emergency response, it is important to define the process and develop effective working relationships prior to facing a serious injury or fatality investigation. Who should be involved? Adapting from the US Forest Service Investigating Wildland Fire Entrapments individuals with the following skill sets should be involved in structural fire, collapse, or disorientation entrapment events. There are a number of considerations in determining the makeup of the investigative team. Depending on the nature of the investigation, some of these skill sets may not be as critical or a single individual may fill more than one role (e.g., fire investigator and photographer). Unlike the wildland community, there is considerably less clarity to specialization in structural fire behavior. In some cases this may be a fire investigator with specific training in fire dynamics and fire modeling, in others it may be a compartment fire behavior instructor. This will depend on the nature of the incident and available resources. In addition, the technical complexity of assessing personal protective equipment performance (particularly self-contained breathing apparatus) may require specialized external expertise. As in wildland incidents, there is also great value in peer review of structural incidents. Like the more formal investigation, peer review is a team based process, but the team is comprised of a small group of experienced firefighters and fire officers who are known to be insightful, fair, just, and honest. Agencies use a team based, multi-agency approach to investigate structure fire, collapse, and disorientation entrapments (inclusive of near miss events). Please post your thoughts on this process and how we can best develop and communicate lessons learned from entrapment events occurring during structure fires. In May 2006 US Forest Service Fire and Aviation Management published a briefing paper on Peer Review Process . Later that year, a peer review team used the process to investigate a near miss incident in the Shoshone National Forest and issued a report titled Little Venus Fire Shelter Deployment . This report provides an interesting look at the peer review process and potential benefits of a similar approach to identifying and communicating lessons learned in the structural fire service. ..to reduce errors by correcting or reinforcing upstream behaviors and other factors. Peer reviews provide a means to learn from a variety of situations including close calls, significant events, and other routine performance evaluations. The objective is to create a culture that expects and values peer reviews as an important means to discover subtle indictors of potential future errors and as a catalyst for positive change. It is important to emphasize that peer review goes well beyond the context of accident and near miss investigation. This process applies to a broader range of significant events. Like entrapment investigation, peer review is a team based process, but the team is comprised of “a small group of operators known for their ability to perform the particular mission in the particular environment, and also known to be insightful, fair, just, and honest”�. This approach is consistent with the focus of peer review on developing lessons learned. In many respects the peer review process gathers the same types of information as the National Firefighter Near Miss Program. However, there is a significant difference. In peer review, team members are encouraged to “continue questioning in areas where the reviewers feel disconnect, discomfort, confusion, or curiosity”. Peer review reports such as the Little Venus Fire Shelter Deployment take a middle ground between a comprehensive organizational assessment seen in some agency reports (see reports from Loudon County Fire and Emergency Management and Prince William County Department of Fire and Rescue) and more limited information provided in National Institute for Occupational Safety and Health (NIOSH) Death in the Line of Duty reports. Peer review requires a bit of organizational and individual courage and commitment. One element of the deliberate practice required to develop expertise in any field is feedback on results and engaging with that feedback to refine and improve performance. Individuals and organizations must have the courage to ask for feedback and accept performance related feedback, which may be uncomfortable or difficult when things do not go well. A more fundamental and underlying challenge lies with our underlying assumptions about the nature of fire, firefighting, and the business that we are in. Future posts will address at these important issues. Structural firefighting agencies can draw some valuable lessons from the wildland firefighting community. Fire behavior training in many structural agencies often begins and ends in recruit academy. For wildland firefighters, fire behavior training involves an extensive, multi-level curriculum (S-190, S290, S-390, S-490 and so on). The wildland community is also more substantively engaged in analysis of fatalities, accidents, and near miss events with the intention of impacting policy, procedure, and performance. This is not to say that they have a perfect safety record, far from it. However, this ongoing effort to identify and implement best practice based on lessons learned is worthy of emulation. A situation where personnel are unexpectedly caught in a fire behavior related, life-threatening position where planned escape routes and safety zones are absent, inadequate, or have been compromised…These situations may or may not result in injury. They include”near misses”�. The concept of entrapment applies equally in the structural firefighting environment. I read news accounts of extreme fire behavior related events (e.g., flashover, backdraft) from around the United States on a weekly basis. Flashover, backdraft, or other extreme fire behavior often results in a near miss or minor injury and less frequently in serious injury or fatality. Some (actually very few) of these incidents are documented in the National Firefighter Near Miss Program. As discussed in my last post, the near miss program uses self-reported data. This is extremely useful in determining the individual’s perception of the event and what lessons they took away from the experience. However, the individual reporting the event may or may not have the training or education to recognize what actually happened, determine multiple causal factors, and provide a reasonably objective analysis. Near miss events and events involving extreme fire behavior resulting in minor injuries or damage to equipment frequently are not or are inadequately investigated to identify causal factors and lessons learned. Investigation of serious injuries and fatalities in many cases do not adequately address fire behavior and interrelated human factors that may be directly or indirectly related to the cause of the incident. This results in lost opportunities for individual and organizational learning. Two interrelated challenges make investigating extreme fire behavior events or structural fire entrapments difficult. First is the lack of a formal process or framework for this specific type of investigation and second is potential for investigators lack of specific technical expertise in the area of fire behavior. This team is established and begins the investigation as soon as possible after the occurrence of the event to ensure that critical information and evidence is not lost. The investigative process and documentation focuses on accurately describing what happened, when it happened, causal and contributing factors, and recommendations to reduce the risk of future occurrence. What might this look like in the structural firefighting environment? Lessons learned must be integrated into appropriate training curriculum to ensure that the lessons are built into organizational culture. Some agencies have taken steps in this direction. Following the line-of-duty death of Technician Kyle Wilson, Prince William County Department of Fire & Rescue conducted an in-depth investigation which integrated use of computational fluid dynamics (CFD) modeling to describe likely fire conditions and the influence of wind on fire behavior. Following the conclusion of this investigation, the report and related presentations have been distributed widely. Investigating Wildland Fire Entrapments identifies timeliness as being essential in dissemination of the lessons learned. This presents a significant challenge when faced with a complex event involving a major injury or fatality. However, it is likely that timeliness in communicating lessons learned can be improved without compromising the thoroughness and quality of the investigation. My next post will examine the US Forest Service’s less formal Peer Review Process which may be used following near miss events or significant events regardless of outcome (possibly concurrently with a formal investigation). Like the entrapment investigation procedure, there are likely some lessons here for the structural firefighting community! What is the difference between a fairy tale and a firehouse tale? Fairy tales generally begin with once upon a time, while firehouse tales begin with you wouldn’t believe what happened last shift and no, this really happened. This post begins with a firehouse tale. A crew of firefighters advances a 1 1/2″ (45 mm) hoseline up a stairwell in a large wood frame house. The second floor is well involved, and the smoke level is down close to the floor. The young firefighter with the nozzle indicates that it is too hot to advance onto the fire floor. The officer moves up close to the nozzle and evaluates conditions, finding that the firefighter is correct. The officer calls the incident commander and asks for ventilation to raise the smoke level and relieve some of the heat that is preventing advancement onto the fire floor and an attack on the fire. Moments later, the officer is enveloped in fire and feels himself flying backward through the air. This ends when he slams into a hard surface. Everything is black, and he is unable to see. It is not hot, and eventually, he sees a glimmer of sunlight. Attempting to remove his breathing apparatus facepiece, he experiences discomfort in both shoulders, but is able to pull the facepiece off, discovering that the darkness was caused by blackening of the exterior of his facepiece lens. The building is still well involved, the hoseline extended through the front door, but the crew of firefighters that was with the officer are nowhere to be seen. The officer pulls his facepiece back on and crawls back in along the hoseline, finding the firefighters frantically trying to make the fire floor, thinking that their officer had been blown down the hallway instead of up and over their heads, balling down the stairwell behind them and rolling out into the street. The officer withdraws his crew as other crews extend hoselines to the second floor, and extinguish the fire. In this incident, the officer with the hoseline was unaware that significant indicators of a potential backdraft in an enclosed section of the second floor were visible from the rear of the structure (where the incident commander and the crew performing horizontal ventilation were located). The effects of the backdraft were serous but could have been much worse. The officer received minor burns, injured both shoulders, and severely damaged his facepiece and turnout coat. What made this incident worse was that it occurred during live fire training with a group of recruit firefighters. I know that this firehouse tale really did happen as I was the officer in the story. This incident occurred in the late 1970s while I was working for the Massachusetts Firefighting Academy as a part-time instructor. Unfortunately, while academy staff investigated this incident, the outcome of this investigation did not impact substantively on training practices, and at the time, the academy staff did not widely communicate lessons learned. How many of you have had a close encounter with extreme fire behavior? One where you said that was close or you suffered a minor injury? What did you learn and how did you share this information? Often, as in this backdraft incident, those involved learn a valuable lesson, but do not share the information beyond the firefighters and officers they work with. Many things have changed since the 1970s. One is the existence of National Fire Protection Association 1403 Standard on Live Fire Training Evolutions. While not perfect (but that is another topic for discussion), it identifies systems of work that increase the safety of participants engaged in live fire training. Another, more recent change was the development of the National Firefighter Near Miss Reporting System. This system leverages the advantage of the World Wide Web to provide the ability to report near miss incidents and widely share our lessons learned. If you have been involved in or witnessed a near miss incident or have been told of the event, you can anonymously submit a report and share what you have learned. The data submitted to the Near Miss Reporting System does not go into a vacuum. Following review, and removal of information which would identify the agency involved, reports are posted in a searchable database on the firefighternearmiss.com website. This program is a tremendous resource! Visit the site and search on flashover (38 reports), backdraft (9 reports), rapid fire progress (4 reports), or smoke explosion (33 reports). Remember, this database contains self-reported information. This does not make it less useful. In many ways it is more useful than distilled and analyzed information presented in other types of reports (particularly when the individual was involved in or witnessed the event). However, there may be technical inaccuracies (particularly with regards to extreme fire behavior phenomena) and the lessons learned by the individual who submitted the report may or may not be what you want to take away. Read the reports, think about the factors that influenced the occurrence of the event, how it could have been prevented, trapped or mitigated, and draw your own conclusions. If you are involved in, witness, or are told about a near miss event, report it. The more information in the database, the greater the potential to identify patterns of causal factors and develop strategies for improving firefighter safety. Near Misses, Injuries, and Fatalities, Just Part of the Job? In 2007, twenty firefighters in North America lost their lives due to extreme fire behavior while engaged in interior structural firefighting operations. The United States Fire Administration Report 2007 Firefighter Fatalities in the United States and the NFPA Report Firefighter Fatalities in the United States-2007 provide analysis of firefighter fatalities that occurred during this year. Neither report specifically addressed the issue of firefighter fatalities as a result of extreme fire behavior. In fact the NFPA report classified a significant number of these fatalities as being the result of structural collapse (despite the fact that collapse occurred some time after rapid fire development trapped the firefighters involved). Thus far in 2008, eight more firefighters have died due to extreme fire behavior while working inside burning buildings. This is the tip of the iceberg! Since January 2008, there have been several incidents in which rapid fire progress trapped multiple firefighters. In each of these incidents the firefighters escaped with serious injuries. In What’s Changed Over the Last 30 Years , Fahy, LaBlanc, and Molis state that the rate of traumatic fatalities while engaged in offensive firefighting operations inside burning building has been increasing. In many cases, extreme fire behavior is a causal or contributing factor. It is critical that firefighters understand compartment fire behavior and can apply that knowledge to maintain situational awareness and make effective decisions on the fireground. Fire behavior training for most firefighters and fire officers is limited to a few hours during recruit academy and possibly brief mention during tactical training. This is not adequate! At the 2008 International Association of Fire Chiefs Conference in Denver, Colorado, Chief Fire Officer Charlie Hendry of Kent Fire Rescue Service and President of the United Kingdom (UK) Chief Fire Officers Association discussed a number of significant incidents that impacted his nation’s fire service. One of these incidents was a backdraft in townhouse apartment in rural Wales that killed Firefighters Kevin Lane and Stephen Griffin. This incident and the subsequent investigation by the British Fire Brigades Union and the Health and Safety Executive identified major training deficiencies, resulting in changes in fire behavior training across the UK. For a brief overview of the incident and discussion of its impact on the UK fire service, see Blaina: A Perpetual Legacy . Where is the recognition that the American fire service faces the same problem on an even larger scale? What can we do, individually and collectively to address this issue? I will be writing about this topic for the next couple of weeks. Add a comment to this post with your ideas! In the Grading the Fireground on a Curve , published in the September issue of Firehouse magazine, Battalion Chief Mark Emery warned of the hazards of assuming that limited volume and velocity of visible smoke indicates a growth stage fire. He correctly identified that compartment fires may enter the decay phase as fuel is consumed or due to a lack of oxygen. Emery cites National Institute for Occupational Safety and Health (NIOSH) Death in the Line of Duty reports 98-F07 and F2004-14 , in which firefighters initiated offensive fire attack in commercial buildings and encountered rapidly deteriorating fire conditions due to changes in the ventilation profile. Concluding the introduction to his article, Emery observes “Unless you know which side of the fire growth curve you are entering, advancing into zero-visibility conditions is really a bad idea”. I agree with BC Emery’s basic premise that appearances can be deceiving. However, this article points to two interrelated issues. The hazards presented by ventilation controlled fires and the dangerous conditions presented by enclosed buildings. In Smoke Burns ,originally published on Firehouse.com I discussed the hazards of ventilation controlled fire and the relationship of burning regime to extreme fire behavior phenomena such as flashover and backdraft. The hazards presented by ventilation controlled fires are compounded when the fire occurs in an enclosed structure (a building with limited means of access and egress). Captain Willie Mora has written extensively on Enclosed Structure Disorientation on Firehouse.com. BC Emery illustrated how appearances can be deceiving using data and still images from a full scale fire test in a warehouse in Phoenix, Arizona conducted by the National Institute for Standards and Technology (NIST). NIST conducted these tests as part of a research project on structural collapse. However, the video footage and temperature data from this test is extremely useful in studying the influence of ventilation on fire behavior and fire behavior indicators (Building, Smoke, Air Track, Heat, and Flame (B-SAHF)). The full report and video from this test is available on-line from the NIST Building Fire Research Laboratory (BFRL). As an oxidation reaction, combustion requires oxygen to transform the chemical potential energy in fuel to thermal energy. If a developing compartment fire becomes ventilation controlled, with heat release rate limited by the oxygen available in the compartment, pyrolysis will continue as long as temperature in the compartment is above several hundred degrees Celsius. Pyrolysis products in smoke are gas phase fuel ready to burn. Increased ventilation at this point, may cause the fire to quickly transition to the fully developed stage (ventilation induced flashover). However, if the fire continues to burn in a ventilation controlled state and the concentration of gas phase fuel (pyrolysis products and flammable products of incomplete combustion) increases sufficiently, increased ventilation may result in a backdraft. I take issue with BC Emery’s illustration of the growth side of the fire development curve as the value side of the cure and the decay side of the curve as the no value side of the curve. Depending on resources, a fire on the growth side of the curve may exceed the offensive fire control capability of the fire department. Conversely, a fire on the decay side of the curve which is limited to a single compartment or series of compartments may be effectively controlled using an appropriate tactics in an offensive strategic mode. However, Emery’s discussion of the more subtle indicators of burning regime that may warn firefighters of a ventilation controlled fire is right on track. For more information on fire behavior indicators and fire development, see Fire Behavior Indicators and Fire Development Parts I and II on Firehouse.com. Many firefighters consider Positive Pressure Ventilation (PPV) to be a new tactical approach, despite practical application in the United States since the 1980s. Since its inception, PPV has strong advocates and equally strong opponents. In many cases these opinions sprang from observation of inappropriate application of PPV without a sound understanding of how this tactic actually works. Early on there was little scientific research integrated with practical application of PPV tactics. However, over the last six years the National Institute of Standards and Technology (NIST) has been conducting an ongoing program of research to identify how PPC works, factors influencing effectiveness in varied applications, and best practices in the application of this tactic. Steve Kerber served as principal investigator on this project. Steve is a fire protection engineer (who also serves as a volunteer Chief Officer in Prince Georges County, Maryland). Steve authored an excellent article titled NIST Goes Back to School published in the September/October issue of NFPA Journal . This article provides a brief overview of the NIST research on PPV to date and outlines a series of tests conducted in a two-story, 300,000 ft2(27,871 m2) retired high school in Toledo, Ohio, to examine the ability of PPV fans to limit smoke spread or to remove smoke from desired areas in a large low-rise structure. In this limited series of experiments the pressure was increased sufficiently to: reduce temperatures, giving potential occupants a more survivable environment and increase fire fighter safety, limit smoke spread, keeping additional parts of the structure safe for occupants and undamaged and reducing the scale of the emergency for the fire fighters, and increase visibility, allowing occupants a better chance to self evacuate and providing fire fighters with an easier atmosphere to operate in. Positive pressure ventilation is a tool the fire service can utilize to make their job safer and more efficient. Ventilation of oxygen limited or fuel rich fires, either naturally or mechanically, can cause rapid fire growth. Ventilation is not synonymous with cooling. Venting was most effective when coordinated with other operations on the fire ground. Strong advocates of PPV and positive pressure attack (PPA) such as Battalion Chiefs Kris Garcia and Reinhard Kauffmann, authors of Positive Pressure Attack for Ventilation and Firefighting also caution against use of positive pressure ventilation under extremely ventilation controlled/fuel rich conditions due to backdraft potential. However, there is no clear line defining when fire conditions are sufficiently ventilation controlled to preclude safe and effective use of positive pressure as a ventilation tactic. Safe and effective use of this tactic requires a sound understanding of practical fire dynamics and the potential influence of tactical operations. This reinforces the ongoing need for scientific research and integration of theory and practical fireground experience in defining best practices in tactical ventilation. NIST Technical Note 1498, Evaluating Positive Pressure Ventilation in Large Structures: School Pressure and Fire Experiments as well as reports related to NIST’s prior PPV research are available at the Fire.Gov web site. Downloadable video footage is also available for each of these NIST PPV tests. Firefighter survival skills, MAYDAY, and rapid intervention training have received a great deal of emphasis over the last several years. These skills are critical. Firefighters must react correctly when faced with a breathing apparatus malfunction, structural collapse, or extreme fire behavior event. However, the most effective approach to survival is to prevent or reduce the probability of firefighters from facing these conditions. My last several posts have examined the events surrounding a multiple firefighter injury incident that occurred at a residential fire in Loudoun County, Virginia on May 25, 2008. The report prepared by Loudoun County Fire, Rescue, & Emergency Management took a systems approach to examining this incident and the investigative team made 123 recommendations for improving department operations, firefighter safety, communications, behavioral health, training, apparatus and equipment, uniforms and personal protective equipment, and other considerations. This post will examine four of those recommendations that deal with firefighter safety and training. Read the report for additional detail and to examine the other recommendations. Recommendation: Reiterate the importance of visualizing the entire structure prior to making entry [whenever possible]. Recommendation: Develop a system-wide training program that focuses on situational awareness, particularly how to “read” interior and exterior smoke conditions to identify the location and predicted spread of the fire. Recommendation: Implement ongoing, mandatory, system-wide training on Northern Virginia MAYDAY procedures and self-survival techniques. In post incident interviews, all four interior personnel credited their escape from the structure with ongoing self-survival training. Recommendation: Develop and implement system-wide, entry-level and ongoing firefighter self-survival training that at a minimum addresses RIT, flashover, MAYDAY procedures, crew integrity, ladder bails, emergency SCBA procedures, firefighter drags and carries and practical scenario-based evolutions. These recommendations are excellent, but do not go far enough! Visualizing the entire structure whenever possible and “reading” smoke conditions on the exterior and interior are a critical component in developing awareness of incident conditions and predicting anticipated fire development and spread. However, smoke is only one fire behavior indicator; a more comprehensive approach integrates assessment of Building, Smoke, Air Track, Heat, and Flame (B-SAHF) indicators along with a sound understanding of practical fire dynamics. If flashover is imminent, firefighters are taught to practice aggressive cooling with a 30o fog pattern to the right, to the center, and to the left. If this tactic fails, firefighters are directed to get as close to the floor as possible, open the nozzle fully, on a wide fog pattern, and rotate the nozzle about their head in a circular pattern. Unfortunately, many flashover training programs teach these methods, but do not substantively address use of gas cooling and ventilation tactics to control the fire environment and prevent the occurrence of flashover or other extreme fire behavior phenomenon.